ALL IN PRICE: From $4799 CAD per person*. Rate is per person, land only, double occupancy, tour inclusions and available options may vary based on departure date. Use code "APRSAVE". Use source code "APRSAVE" for savings. Offer valid on new bookings only made between 04/01/2019 – 04/30/2019. Offer valid on new bookings only and can expire earlier due to space or inventory availability. Savings amount will vary by tour and departure date, and is only available on select departures. Space is on a first come, first served basis. Offers are not valid on group, existing bookings or combinable with any other offer. Other restrictions may apply. Promotional pricing may remain in effect after the expiration date. Set out on your overnight flight to Italy! Begin in Stresa, on the shore of Lago Maggiore. Visit a wine shop and enjoy a cocktail party, tasting some local specialties. A boat transports you to your welcome dinner on Isola dei Pescatori,* the most picturesque of the Borromean Islands. Today, visit an ancient village nestled in the mountains where you’ll stop at a local farm to sample their artisanally produced cheeses paired with the region’s delicious wines. The remainder of your day in Stresa is at leisure. Perhaps you will investigate the piazzas, flower-lined cobblestone streets and lakeside promenades; or, relax on an optional cruise on this scenic lake and take in the breathtaking surroundings. Depart the Italian Lakes region for Sestri Levante on the Ligurian coast. Stop at Lake Orta and take a boat to Isola di San Giulio. Walk the grounds of this charming island with its working convent. Experience the outdoor cafés and shops of this lakeside resort. Continue on to the Italian Riviera. Spend your day discovering the colourful Cinque Terre, a UNESCO World Heritage site. Travel by rail through the medieval villages of the Cinque Terre, perched on the edge of the sea. Traverse the rugged coastal area dotted with terraced vineyards, arriving at this nearly inaccessible string of fishing villages tucked between the mountains and the Mediterranean. Feel like you have stepped back in time. Spend an afternoon independently exploring this magical place. Your Tour Manager will be on hand to help you plan your adventure. Get to know Florence with a walking tour of the city’s treasures and monuments, including the Piazza del Duomo, the centre of religious life in medieval Florence, and the Piazza della Signoria. Visit the Academy Gallery to see Michelangelo’s magnificent sculpture David. Explore independently before returning to your villa. Travel to Siena for an expert-led walking tour. Visit the town’s dramatic cathedral, a stunning example of Romanesque and Gothic architecture. Stroll through narrow medieval streets as you experience life in this historic cultural centre. Return to your villa for a relaxing afternoon. 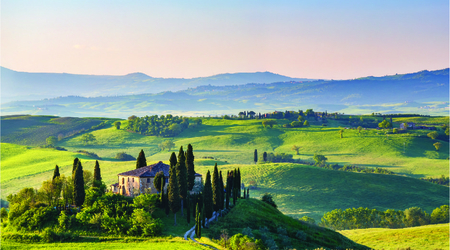 Visit a winery in the heart of Tuscany that showcases the wine cellar, family estate, vineyards and olive groves. Participate in a Tuscan cooking lesson given by the winery’s own chef. Enjoy an authentic Tuscan lunch expertly paired with wines produced on-site. Return to the villa for some leisure time. At dinner, continue your sampling of Tuscan cuisine in one of Tuscany’s traditional restaurants. Depart for Venice. En route, stop in Bologna where we take a guided walking tour of the centre, virtually unchanged since the Renaissance. We’ll also sample local delicacies at specialty food shops. Later, arrive in romantic Venice for your 2-night stay. Enjoy a boat trip*** to Murano Island for a fascinating glass-blowing demonstration. 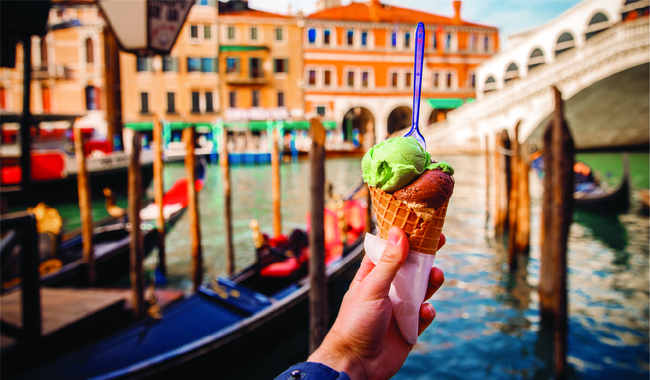 Return to St. Mark’s Square for a locally guided walking tour featuring the Clock Tower, St. Mark’s Basilica, the Bridge of Sighs, and a visit to the Doge’s Palace. Tonight, partake in a celebratory farewell dinner. Hotel Santa Marina, Venice is an elegant and comfortable 4-star hotel. It is located nearby to Piazza San Marco and the Rialto. Built on the walls of an old convent, Hotel Santa Marina has a splendid terrace in the centrally-located but quiet Santa Marina Square. Interested in SAVE up to $400 per person in Italy with Collette?